Since she was a young girl, Christie Bogle was always hanging around her father's shop while working with and learning about each of the tools he was using. “I got into metalsmithing at a really young age because my dad taught me how to weld when I was about 12,” she recounted. “My favorite thing would be to hang out in the shop with him. He would teach me the tools and everything and once I got to a point where I was watching him do these projects and I was so fascinated with the outcome, he'd let me weld some things together and experiment and have fun. So I'd just build funny sculptures and things like that.” She said with a smile on her face. It really does come down to my father. Without even knowing what he was doing, I think he was just constantly instilling this pride in me of working with your hands. 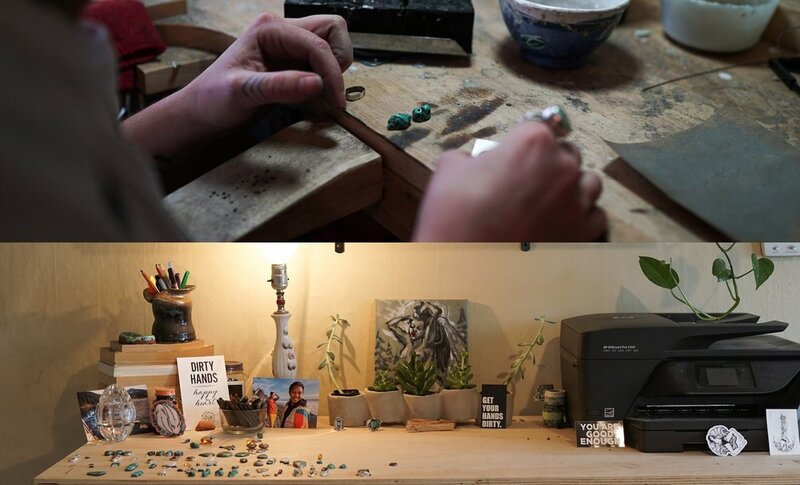 When asked what her process is like to create her pieces of jewelry, she described it as a mix of chaos and strategy. “Sometimes stones will accidentally bump into each other and I'm like, ‘Oh my gosh! There it is. That is the combo that I needed.’ Other times, I will strategically pick out 10-12 stones that I feel will work well together for a collection.” No matter her process, she’s also trying to find her creative space and a place to sink into for hours.